So, I have been a bit quite lately, but I have a good excuse. 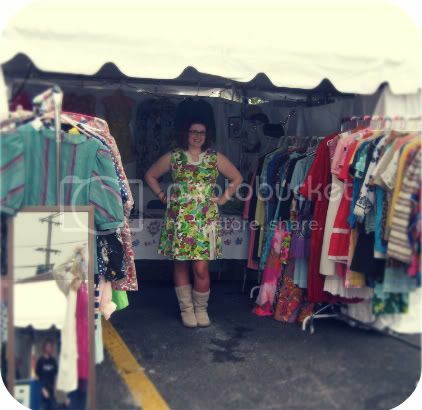 Besides starting my final year of grad school a few weeks ago, this past weekend I did my first event selling vintage. I had a blast and it was a very successful weekend!! Ferndale, MI, a super hip area right outside of Detroit, has starting having a yearly street fair featuring a DIY ethic and this year I decided to join in on all the fun. I really enjoyed doing the event, so much so that I am planning on trying to do some more events in the area. My mom helped me set up my booth (which you can see in its entirety above). I can't remember what blog I saw it on (if it was you, please leave a comment! 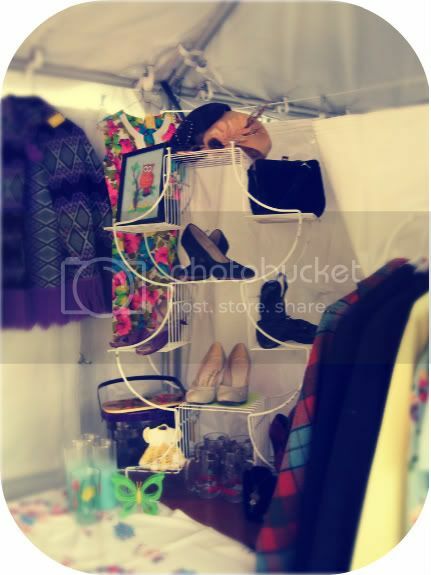 ), but one of the other vintage bloggers out there that does events used a plant stand to showcase some of their items. I thought this was a fantastic idea and decided to do the same in my booth. 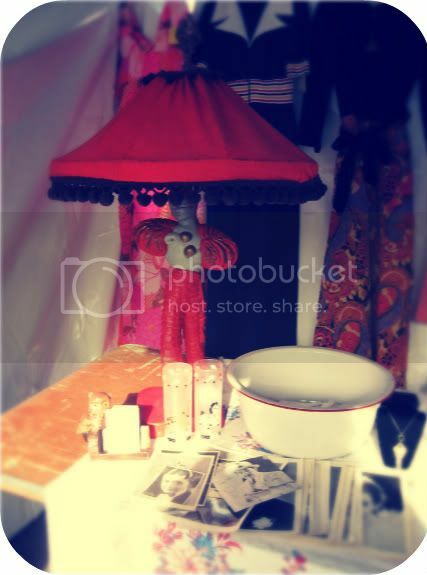 Besides selling vintage clothing, I sold a few vintage housewares and some classic movie memorabilia. I also brought Morocco (the lamp above) to find a new home. As my beau has pointed out, I have quite the collection of lamps, so it was time to pass on this one to a new home. He was, however, bought by an antiques dealer whom I know is going to flip this purchase. Oh well; I made quite the profit on him so I am not too bummed about the sale. It was warm enough one of the days to wear my new hawaiian set that I found at a killer estate sale. What was so crazy about this was I found the exact same set a few weeks earlier in a smaller size at the thrift store. I have only ever come across a few "vintage twins" in my life and this was certainly one of the most exciting. I am looking forward to wearing this set (which came with the most adorable shorts) next summer, but until then, I am loving the dress with my orange tights. How exciting! I'm glad everything went well. omg, now I'm sorry I missed this - I would have like to meet you (and check out your wares.) 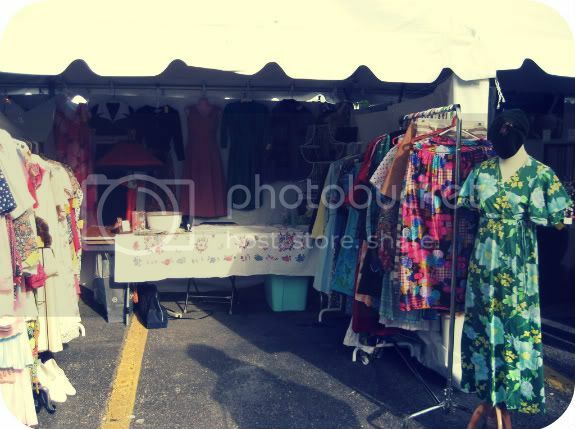 Glad it went so well - your booth pix look great.